It’s not a secret to our Los Tweens’ readers that we are HUGE supporters of the movie “EPIC“. Besides the close familial ties we have to one of the animators, we very much enjoyed the movie for its messages. Epic follows the tale of Mary Katherine (M.K.) and her attempts to reconnect with her father as well as reconcile with the wild ideas that he has about tiny creatures in the forest. Ready to give up, M.K. suddenly finds herself in this tiny creature world – the world of the Leafmen – and becomes an integral part in saving it. EPIC includes a star-studded and multi-cultural cast of voices. Beyoncé, Pitbull, Steven Tyler, Colin Farrell and other stars lend their talents to the animated characters and really bring this movie to life. Watch the My Los Tweens’ Reporters review of the movie and read the animator interview HERE. 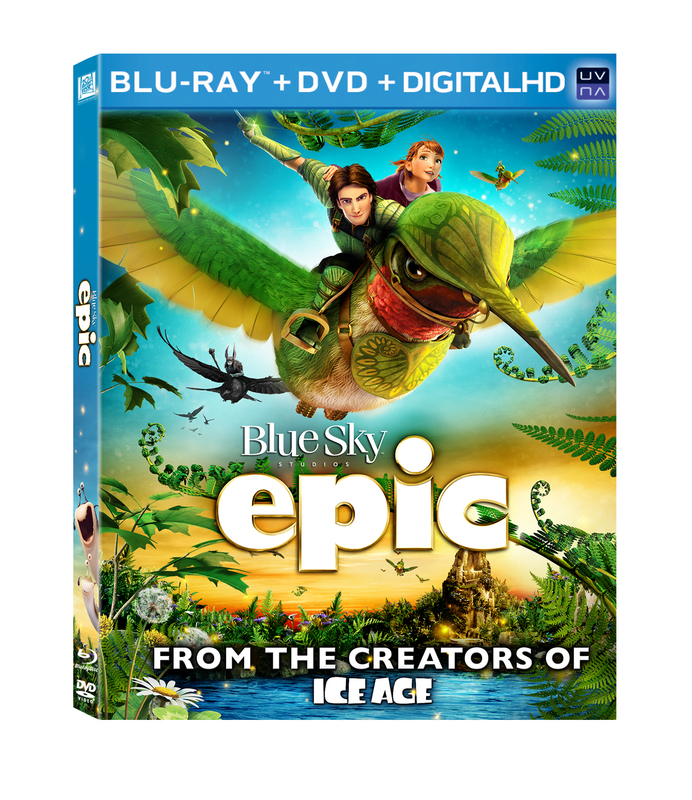 The EPIC Blue-Ray Combo Pack, Deluxe Edition Blu-Ray and DVD will be released on August 20th. The Blu-Ray and DVD include a Mub and Grub (the tween’s favorite characters) intro, games, and interviews with the animator (including Katherine’s brother). Plus, an EPIC Coloring and Storybook Builder app so the tweens can build their own EPIC story and share it with friends. Pick up your copy of the EPIC DVD/Blu-Ray or win one by entering our giveaway! To enter, leave a comment sharing what makes a great animated movie and please read all of the details below before. Good luck! 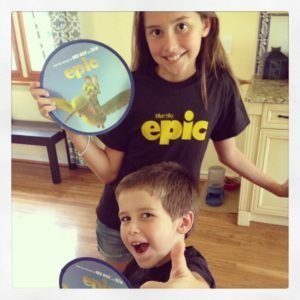 EPIC DVD Giveaway is open to U.S. Residents 18 years of age or older. To enter, leave a comment on this blog post that discusses what makes a great animated movie. Please be sure to include your email address when signing up. Giveaway begins August 12th, 2013 at 8:00 a.m. EST and ends August 19th, 2013 at 8:00 a.m. EST. This entry was posted in Entertainment and tagged DVD, Entertaining. Tweens, EPIC, giveaway, Movie, Tweens. Bookmark the permalink. what makes a great animation movie to me is the colors i like them to be bright and eye catching and most importantly it has to have an interesting story so I wont feel like falling asleep or changing the movie. I think a great animated movie holds the attention of the the audience. It should be visually appealing, funny, have great characters, and an overall positive message or lesson. I think a great animation has to be visual stunning, have relate able characters, great songs, something kids and adults can enjoy together. I Think What Makes A Great Animated Movie Is Great Visuals, A Family Friendly Theme, Fun Characters, Music, Voices That Fit Character, And Great Lessons! I think humor and creativity are what make a great animated movie. Something that a whole family can enjoy for a lifetime. A great storyline with humor for both adults and children make a great movie. Great 3D effects also make an animated movie more enjoyable. A movie with nice color and animation as well as a great storyline with fun characters. What makes for a great animated movie is of course, the story, and also the quality of the actual animation itself. The visuals are important, because this is the first thing we see when we are watching an animated movie. But the story line is just as important, if not more so (arguably). Because the story is what keeps most people interested in the movie. a good story, great animation and 3D! Plot, plot and…. plot. A great story can carry bad animation but great animation can’t make up for a bad story. How can the Olympics Help Inspire our Tweens and Teens?